Make 3 different little soaps to your partner. You can use silicone ice cude trays as model for example. 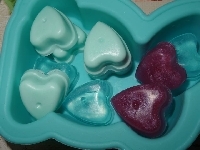 All 3 soaps can be same shape but use different scents and colors or 3 different shapes. Only handmade soaps! Any type of handmade soap is fine: cold process, hot process, melt and pour or hand milled soap.